The changes are a little bit drastic in some spots, but overall not as drastic as I had expected. I had been worried about some issues in the natural flow of where players would naturally end up going, especially early in the game. It turns out we were able to solve these without changing too much. So between last island update and this one, for the most part, some areas were moved laterally or expanded, and some new elevation changes were introduced, but areas were not shuffled around; they are all more-or-less in the same place with relation to each other. So for the most part, things are converging, which is a good sign. And, oh yeah, we are making that mountain a lot bigger. It is the messiest part of the island right now, and has been for a while. There are still a few things gameplay-wise to figure out here, then it will start to come together. My biggest questions in the area have to do with that white building near the bottom of the image; the puzzles inside that building will determine its overall structure, which will determine how it is worked into the surrounding terrain of the mountain. We have some proposals from the architects on what this building will look like, but it is waiting on me to finish the puzzle design. The current puzzle count for the whole game is 450. That looks beautiful. I can’t wait to explore the island and the insights it might have in store. That’s a pretty unusual-looking water shader, I imagine it’s gameplay related? Hard to say! Maybe it’s just unusual because the game is not done yet. Sorry it it came off as criticism, I was just speculating that you might have a water reflection/refraction-related puzzle or two in there. Jonathan, please shut up and take my money already! Do you want players to head to ‘easier’ puzzles at the start? or not feel suggested to go anywhere in particular? It’s not about easy versus hard, really, it’s about things that do not require context to be established, versus things that do. And also just the basic principle that you don’t want to encourage people to go places that aren’t fruitful to go, at least, not early in the game. I wonder, why not enforce the player’s path? For example, in Braid the worlds only opened after completing certain puzzles. If there are areas that are objectively ‘early game material’, wouldn’t it be more honest to just make people play those areas first? No, because that is not the kind of game this is. Too many games force the player to do things in a certain order; with this game I am not interested in that. I do, however, think it’s a good idea to at least strongly communicate that certain areas are intended to be good beginning areas, and that if you break away from that then you are clearly making that choice. The island has attained a certain beauty which is very rare. That beauty of an environment which has been meticulously designed. I have most recently seen this surprisingly thoughtful environmental design in Dear Esther. I was wondering if you can think of any other 3d games which have had nearly this level of attention put into world design. Level design is usually rather sloppy, and areas are drawn out based entirely on having a great vista reveal, without any deeper reasoning behind the actual environmental experience. Just wondering what you feel like about this. Is there any reason to arrange a 3d space one way versus another, in the general sense? Is it primarily just aesthetic, or should gameplay be a concern? How do you make intelligent layout decision when you are giving the player so much freedom? 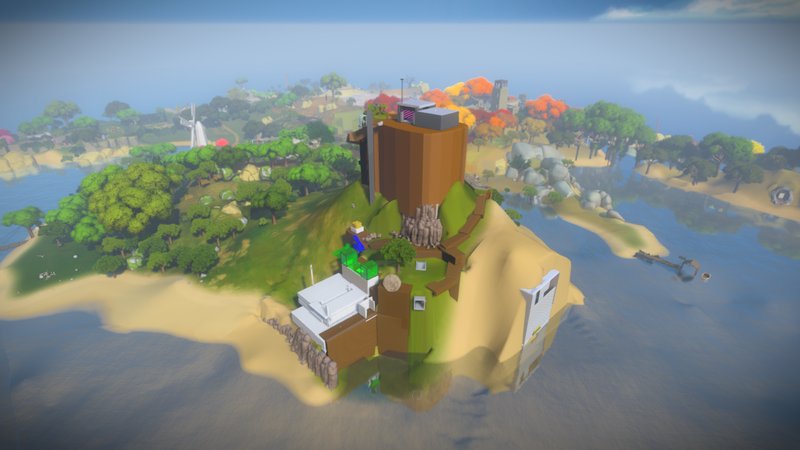 The island’s looking awesome. To be honest it’s bigger than I imagined, and it looks like it’ll be absolutely draw-dropping to explore it, let alone unravel any mysteries behind it. Also, the shape looks really interesting, with thin bits linking larger bits, instead of just a singular, circle-shaped chunk of land. Just wondering, will the player be able to swim? If so, are you planning to have the player swim at any point? And how will you stop the player swimming away from the island? There’s no swimming. We use water as a barrier to clearly communicate where you can’t go. 1) Do you think this will be out sometime this year? 2) Will there be a build for the Wii U? After seeing what your doing for puzzles, that kind of interface looks like it would fit perfectly. Very excited for this game, the island already occupies a small part of my mind as I consider the types of questions it might tackle. A question for the completionist-minded… will the game contain any sort of queues to indicate where additional missed puzzles might be found? Or is it relatively easy to find all puzzles, just not to actually solve them? I guess I mean, are some puzzle panels themselves a puzzle to find? I’m one of those that must see every nook and cranny, especially in a game like this one. I am also very interested in this. In Braid you could easily see were you had gone and where you had never been and what puzzle were done and what you were missing. I hope it will be easy to see your progrees and complete vs incomplete in the island in a subtle way that uses the enviroment just like Braid used the house and doors and secret passages, for those plyers that are not deaf or color blind or people who just to”win” the game with 110% completion. I find myself hoping for the opposite. I hope it feels like a real world, where careful thought and observation lead one to satisfying insights, full of unknown un knowns. Yeah, this might be cool too! But I get what he said about Braid. Things were very clear with not interface ande realistic aswell because they used the space where evrything took place in… That could be realistic somehow! But I want to practice seeing and critical obvservation more than anything! Find it interesting that the island appears to be divided up into various regions as well as seasons (minus winter from what we can see). Will this possibly have an impact on the types of puzzles found in these areas? Or is it only for aesthetics? Are the caves area still in the game or did you find that something better?! That’s pretty owned by Dear Esther now since the game did it so well so I wanted something that the Witness invented only for it self that was new and nobody had or thought about! The caves are not in the game any more, but it doesn’t have anything to do with Dear Esther. Video games have caves all the time, and these particular caves ended up not working as well as I wanted gameplay-wise. The new area is way better. I like the almost clay-like quality of the graphics which make everything look like it is made of the icing of a cake. lol we all want this really bad! What ever I find in the island will transform me, I need this I need it! I must recieve the teachings and lessons from the island to become better in the real world It will stay with me I know it even after I put down the controller and turn off the console. Things like this, Ideas, are infectious! And all the ideas in The Witness are possitivc, hopefull and influencial transformative forces that if played will change us. This is what Braid did to me. That makes me think! Does the island have a name? Does it need one or is it better if it has no name?! Hmm idk how it would be?! MAybe the name of the island could be a puzzle it self?! Like the nautical flags in Braid. EVERYTHING HAS A PURPOSE! THERE ARE NO COINCIDENSES! …that’s what Braid tought me too! Dude, I think it’s unhealthy to put this much faith into someone else’s work. Especially since you haven’t even seen it yet. It sounds like you have big ideas about the potential of video games. Maybe instead of putting Jon Blow or some other game designer on a pedestal you should focus on ways that you can express your own ideas to the world. You’re obviously very passionate, I think you could do great things. I just think you’re holding Blow to an impossible standard, and you’re bound to be disappointed and disillusioned. But hey, maybe that’s something you need to go through before you can start on your own path. Or maybe I’m totally off base. nah, its cool! I’m currently working towards a masters in computer science and I have been self teaching myself 3D modeling and animation. Im working towards my own things and in way developing ideas in my head of what might be cool games or atleast what I thing is interesting to me right now. Not worried though, Jonathan will deliver! What ever it is he gives us that’s what we need. That’s what I need! It’s not about expectation or hype or what I want or believed will be in the game. Is about what the creator believes we need and then that’s what he will give to us. I’m sure it will be something important and helpful for my life just like Braid was. What nautical flags? I’m gonna have to go back and have a look now! I think this game will rely more on natural player guidance by using things like terrain and other more subtle cues… plus it seems like you can follow the power cords to find out where the panels are located. Too much heavy-handed player assistance ruins a game, and I think we have nothing to fear on that front. I think what most excites me about this post is the information that there’s around 450 puzzles in the game. That’s pretty amazing. Hopefully that will translate into a lot of rewarding time spent trying to figure things out. I’m curious exactly how you defined puzzle when coming up with that number. Just out of curiosity and at the same time a question for all achievement enthusiasts throughout the world: Will The Witness be released as a Games for Windows Live game with achievements? No. Why would we ever do that? Games for Windows Live is horrible. Hey Jonathan, for someone so critical of video-games (yet still so passionate about their potential), do you have any personal favorites? Besides Dear Esther, of course. The Binding of Isaac has made me think a lot about game design lately. Dustforce is another game I played recently that I enjoyed a lot. This past week I have been playing Super Monday Night Combat. Did you play Dustforce with a controller or keyboard? I’m not very PC game literate in general, but it does seem to lend itself to the controller significantly better, and it seems like you couldn’t expect most players to have a controller with a cable (for example, I needed to borrow one). 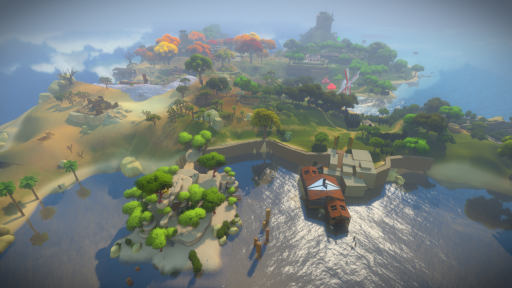 Since the Witness is first person, (not to mention… not a fast-paced platformer), I would imagine it lends itself easier to multiple types of control schemes – but since you are going for a multi-platform release, have you run into any particular challenges in dealing with this? I saw something about iOS on the about page, which is really a whole other animals in terms of controls. I played it with the keyboard. I didn’t want to deal with potential control gumminess involved in using a non-native controller / mappings / etc. Is the phone even possible or you just care about the pad? I have the iPhone 4s and it has the same thingies the earlier pad had. Can it be possible to run the game somehow on the phone even if the screen is too little? …or what are you interested in? I’m playing through Fez, so I’ve been thinking a lot about sound design lately. Aside from the audio logs, which I’ve heard a bit about, do you guys have any thoughts to share about the process of designing sound for the Witness? When you guys are ready please make some posts of about the sound. What are your thoughts on Planescape: Torment? I thought Dustforce looked interesting based on the trailer I saw on Steam the other day. I’m not really that into the online multiplayer thing, but it’s interesting you mentioned Super Monday Night Combat. While you’ve accused games like World of Warcraft as being “evil” (and I don’t disagree with you), how do you feel about games that have a free-to-play model? In my opinion, games like Team Fortress 2 and even League of Legends offer an impressive amount of content from the start without pressuring you to spend a dime. For example, everything in League can be earned without spending money (except for skins, which are purely cosmetic). No more questions, I promise. Looking forward to The Witness! I don’t mind free-to-play as long as it is done from a position of respect for the player. Somewhat off topic, but have you tried the game The Company of Myself? What do you think of it? Thanks. There are different types of “art games”, and different developers explore the medium in different ways. Jonothan Blow cares only about the message, which is “the click in the head that you get when you finally solve a difficult puzzle”. His games use a very standard format and even throw is some artsy stuff, but it is all in service of the message, or at the very least designed not to get in its way. The Chinese Room see it as their mission to explore the boundaries of the format. Whatever messages their games contain only exit to serve that purpose. Frictional Games try to perfect the format in order to provide exactly the emotional experience they are aiming for. Their message is delivered by the format. You plan to make the mountain larger? Won’t the scale be off, as in a volcanic pimple on the island? Re sound: no vocals, too distracting and specific – Do you know some of “Other Lives” acoustic sound/music? Not with strong lyric development- drums, strings, and some bird calls. It looks magical so far. The scale of everything in this game is already off. That is part of what it means to be a video game! I think this game is beautiful! It looks as if it was inspired by braid. The insightful puzzles and the new line of thinking that has to be done for each puzzle, as well as the comment about the “physical” one show this.